Time and time again I meet patients, clients, fellow competitors, gym junkies and even many trainers and fitness professionals who ask, “what is the best way to strengthen my core and to do core training for women?”. My first response is of course, a pop quiz. I typically ask, “what do you think your core muscles are?” The responses I get may vary a little but they tend to be the same, “your abs?”, some may even go as far as including the low back as well. Close…but no cigar. So, what makes up “the core”? I refer to these 4 muscles as “the building blocks” of all movement. Without proper use of ALL core muscles when core training and good strength & coordination with activity, people are setting themselves up for injuries and conditions such as low back pain, diastasis recti and incontinence (all topics I will discuss in further detail in future articles) as well as missing the key component to better movement and performance. How do I know I’m using the right muscles? Learning how to use these muscles means starting with the basics. Like I said, they are “the building blocks”, without a good foundation all other exercise cannot be optimally performed because you cannot…I repeat…you CANNOT do any movement properly without having good core strength and coordination. Without good core stability and awareness you are (a) setting yourself up for injury, (b) not getting an optimal muscle contraction with other activities, and (c) missing out on your best performance potential. Starting with the basics may be slow and feel too easy, especially for competitors, athletes, CrossFitters and intense exercisers, but I cannot stress the importance of building a strong core through proper core training and learning how to properly use and coordinate your core muscles, especially if you want to perform at your highest level! Stop breathing with your chest and learn how to breathe with your diaphragm. — Your diaphragm is actually supposed to do 80% of the work when you breathe. When this doesn’t happen you limit the amount of oxygen your lungs can inhale and subsequently make is more difficult for the rest of your muscles to get adequate oxygen. Not to mention, when you breathe with your chest your ribcage and neck muscles get over worked and are more likely to be tight and possibly cause pain. A simple way to practice how to use your diaphragm is to lie down, place 1 hand over your abdomen (just below your ribcage) and the other hand on your chest. Take a slow, deep breath into your nose and allow your abdomen to expand. You will know you’re doing this right if the hand over your abdomen rises before the hand over your chest. If this did not happen you have some work to do. Slowly, exhale through your mouth and let your abdomen deflate. Repeat. Practice doing this type of breathing regularly, using your hand placement to make sure you are using your diaphragm and not over using your chest and neck muscles. Do your ‘Kegels’ and do them the right way. — The pelvic floor muscles are probably one of the most important yet severely under-recognized group of muscles. This muscle group holds your organs in place and without them we would all be wetting our pants, our organs could LITERALLY be hanging out, and we would not be able to do most activities without major issues. The pelvic floor muscles are located internally making it difficult to know whether we are engaging them and whether we are doing it properly. Because these muscles are not visible externally, the best way to exercise them is by using cues. Ones that tend to click for many of my patients and clients are, “pretend like you’re stopping the flow of urine”, or for the men, “pretend you’re walking in cold water”…yes…men have a pelvic floor too! It is also important to incorporate the diaphragm breathing along with ‘Kegels’, holding your breath actually can increase the amount of pressure and stress on your pelvic floor. Take a long deep diaphragm breath and as you exhale engage your pelvic floor and hold it for about 5 seconds. Repeat. Practice these throughout the day and incorporate the pelvic floor into every day activities like walking and exercises such as squats. Wake up your deep abdominals with core training for women. 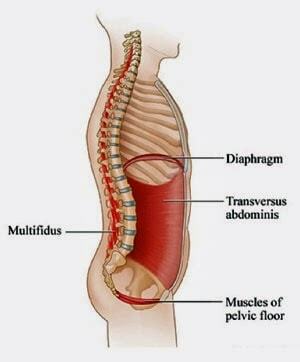 — Your transverse abdominus is the deepest layer of your abdominals and it is meant to act as a brace, your internal girdle if you will, and provide support to your trunk. Many low back issues can actually be avoided and/or managed by having a strong transverse abdominus through proper core training. The problem is most of us don’t use this muscle when we work on strengthening our abs and we lack the strong foundation we need for more vigorous exercise and activity. The best place to start is to first learn how to find the muscle and use it. You can feel your transverse abdominus by lying down on your back with your knees bent, place your hands on your hip bones and slide your hands down and in approximately 1 inch. Cough. That muscle that kicks you is your transverse abdominus. Next, you want to engage that muscle by gently pulling it inwards as your belly button gently pulls towards the spine. Your pelvis should not move. It is a very subtle movement. Just as you did with the pelvic floor, you want to coordinate this muscle contraction with your diaphragm breath and engage the muscle during exhalation. You can even go as far as to engage your transverse abdominus along with your pelvic floor, these muscles help each other recruit. Add this exercise to your every day routine and along with all your daily activities. Keep your spine in check.— Your multifidi are muscles that attach between your spinal segments and provide stability and support to the spinal column and allows the different vertebrae to work more efficiently. A good way to stabilize the your spine using your multifidi is to go into an all 4’s position (arms straight, bent knees) and move your spine up and down until you are in a flat position, like a table top. Maintain this position like you are balancing something fragile on your back (I like to think of my favorite glass of wine) and slowly lift your right leg without letting your trunk move. Return your leg and repeat on the left side. Continue to alternate sides for 3 sets of 10. Think of using these muscles with activities from squatting and lifting to sitting and working at a computer. Although it seems as easy as, “just engage these 4 muscles”, proper core training for women is not so easy. For many of us have spent most of our lifetime NOT using these muscles, compensating and developing bad habits. As a pelvic floor and women’s health specialist I have a thorough understanding of the core, how to use it and how to teach my clientele to incorporate this knowledge into everyday activity. In order to learn how to properly use these muscles and integrate them into everyday activity it’s important to consult and seek guidance with a professional that is a human movement specialist, understands the importance of using your muscles properly, core training and prioritizes using proper form & alignment such as myself and Julie Lohre (the creator of this amazing magazine! ).